The following comic is one not to miss. Based on the true story of Admiral Yi Soon Shin, this comic not only follows the history of one of Korea’s naval heroes it also shows what futile Korea was like in the 1500’s. 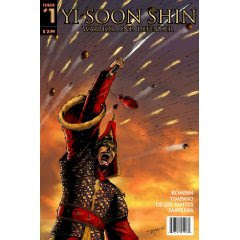 Being a fan of not only comics but of history this graphic novel is out of this world, Admiral Yi Soon Shin was never defeated in battle, a brilliant tactician, he won 23 consecutive victories over the Japanese. Onrie Kompan makes the words on the page come to life, you feel like your in battle with the Admiral. Giovanni Timpano uses Onrie’s words and his own imagination to create both beautiful and graphic depictions of not only the battle scenes but of everyday life in Korea around the 1500’s. As this is a first for me, dedicating an entire blog to a single issue, that should tell you that this is one comic you do not want to pass up. Go get this graphic novel immediately as I will be eager awaiting all future issues. Admiral Yi Soon Shin was never defeated in battle, a brilliant tactician, he won 23 consecutive victories over the Japanese.